You will discover the outstanding view of Florence from Piazzale Michelangelo, the evocative beauty of the hills and villages of Chianti ... .Greve, Castellina, Radda, the enchanting village of Fiesole or the great Piazza dei Miracoli of Pisa with its famous Leaning Tower from where you can leave to discover Garfagnana's landscapes ... .Castelnuovo, Borgo a Mozzano, Barga, with our arranged daily tours. Book our Vespa tours from Florence, we will take you to the charming villages with the opportunity to have wine tastings and buy local products in one of the best winery of the area. You would rather rent a Vespa to live a smooth day visiting Florence? We can do that too. 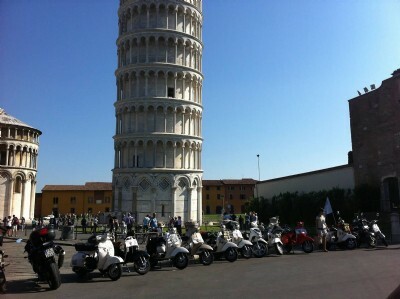 Vespa tours are also available from Pisa, they will lead you to the Etruscan Coast or to an enogastronomic roundtrip through Lucca and Garfagnana. Choose the All Inclusive tour that best meets your needs.